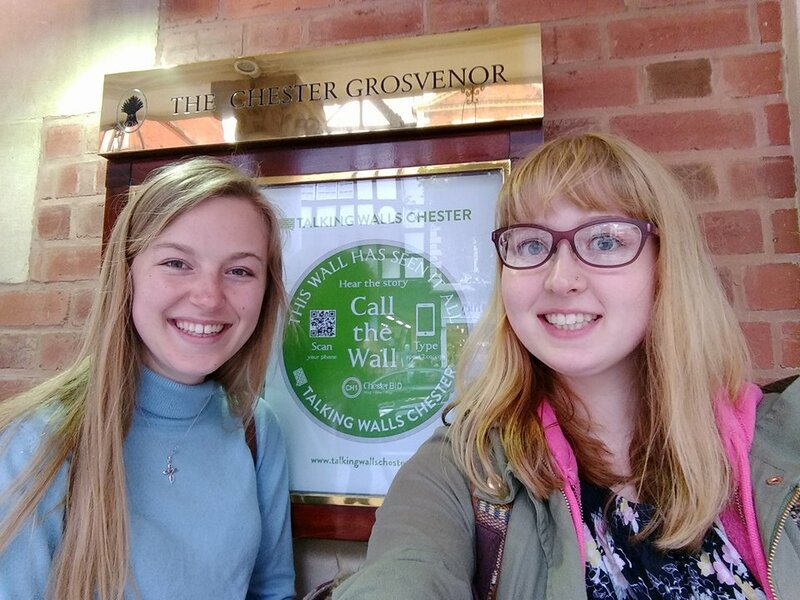 Meg Chester and her friend Becca set out to sample a new visitor experience in Chester, where the city’s ancient walls come to life and start chatting away to all those who stop by to listen. Photos: Meg Chester. The memories of our silver Duke of Edinburgh expedition came flooding back. Ready for adventure, map in hand, and looking a bit clueless, my friend Becca and I went in search of some talking walls. It was a damp day and the fine drizzle seemed to cling to the air – not the kind of day one would usually choose to traipse around a city listening to walls (though I confess, due to my lack of experience in this art, I am not quite sure of the optimum conditions for a good wall-talking-type-of-day!). Nevertheless, the bricks and stones were still up for a chat, as we took part in Chester’s new Talking Walls project. Commissioned by CH1ChesterBID and delivered by Sing London – the organisation that brought to life statues across Chicago, Manchester and Leeds – this innovative arts project has given a voice to 27 of Chester’s vivacious and varied walls. The structures’ knowledge and secrets, buried deep within in their ancient pasts, have been unlocked. Like an unfolding Indiana Jones plot, the city’s history is being revealed. Looking like a pair of lost tourists, Becca and I wandered around Chester, camera, map and mobile in tow, and headed into the Cathedral. We meandered through scattered sculptures of the ongoing modern art exhibition Ark, until we found a green, circular plaque, instructing us on how to call the wall. After taking a quick pic of the QR code and clicking on a URL link, Becca’s phone started to ring. And who should be calling, but the wall itself! The ‘blood-red sandstone’ told us tales of Chester’s incredibly violent, warrior monk, as we stood in the historical cathedral cloisters. I ponder what those cloister walls have seen of me over the years. I think of how they greeted me on childhood Christmas Eves, as my family and I worshipped together at the crib service. How year upon year they watched my high-school self, straightening my tie, before the school carol service began. How, earlier in the day, they had listened to our last minute music rehearsals and debates as to which key we should play in! And that’s just what they know of me – a tiny speck in the span of history. Those walls must have a database of memories more numerous that the bricks with which they are built. They have overheard my prayers and watched me grow. I wonder what more they will see of me in the future, as I continue to enjoy their company? What will they see of you? Our journey then took us to the sprightly young wall at Alexander’s, a millennial boasting of brushes with Ed Sheeran and the likes; to Storyhouse’s recently resurrected wall, which had been witness to glitz, glamour and glitter galore; even to the chic French restaurant that used to house the city’s fire station (there will be no burnt frogs legs there!). Why not explore yourself this summer? Which walls will you bump in to whilst shopping, commuting, holidaying or even just meeting for coffee? The various walls of Chester featured in this initiative have been brought to life by a range of people, including TV’s Louise Minchin and Lucy Meacock and former Chester MP, Gyles Brandreth. Walls are such an integral part of Chester’s identity; they have shaped our Roman history, they house our present everyday, and as new bricks are laid, they build our future. It seems only fair, therefore, that in 2017 they have been given the chance to speak up. They’re talking to you – make sure that you stop by to hear them.